Justin Bieber got another chance to show his unclothed body to the world when Calvin Klein included him in a campaign that boosted pictures of celebrities wearing their products on twitter with the hashtag in #mycalvins. Many marketers are praising this as an expertly executed influence marketing campaign, but really, it’s just celebrity endorsement in SNS wrapping paper. It’s easy to mistake one method for another, and as an observer, it does no harm. But if you want to make your influencer marketing strategy effective, you really need to know the difference. 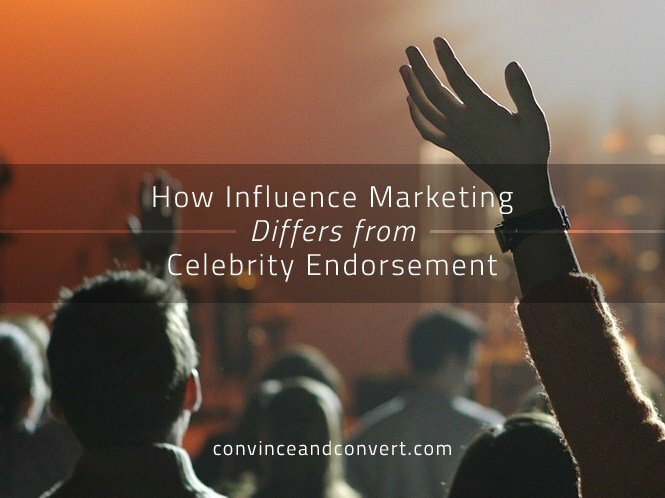 Looking at surface-level definitions “celebrity endorsement” and “influence marketing,” you can see why the strategies seem to overlap. Celebrity endorsement attaches the fame of a celebrity to a brand or product. With this strategy, you are getting people who are idolized to associate themselves with your product so people want to buy it. Influence marketing creates word-of-mouth advertising using people that are trusted in certain circles. With this strategy, influential people are building up your image in the minds of their followers. Both strategies use well-known people to influence your target market. But the way they are executed and how they influence their target market is very different. Michael Jordan doesn’t need to be a fashion expert to recommend Hanes, and Oprah doesn’t need to be a technology expert to recommend Window’s Surface. They are so well known it doesn’t matter that the product lies wholly outside their field of expertise. They are faces the companies’ target markets will recognize and associate with their brand. Influencers are specialists. They’ve built communities around themselves in a very niche space. When a brand sends mommy bloggers their newest breast pump to review as part of an influencer campaign, the goal isn’t notoriety but the generation of true recommendations within the targeted community. Celebrity endorsements are meant to be seen, heard, but not interacted with. Communication with the celebrity runs one way as a single message leveraged on a platform, like a television broadcast, meant to reach as many people as possible. Again, reach is a big deal. On the other hand, the influencer is constantly in a running dialogue with their following. They are answering questions and going into further detail on points of interest with community members. This group is primed to receive messages from the influencer long before the brand comes on the scene. When the influencer produces a piece of sponsored content, it’s part of an ongoing conversation the community is heavily invested in. In a celebrity endorsement, the celebrity is the face of a brand message. The brand scripts, produces and distributes the content, and the celebrity helps relay it. From the target market’s POV, it’s a message from the brand to them, using the celebrity as a messenger. In influencer marketing, the influencer is perceived to be creator of the entire message. If they are a blogger, they are the ones writing the post; if they are YouTuber, they are the ones scripting and editing the video. From start to end, the message is considered theirs, and that lends it a certain credibility and authenticity that celebrity endorsement rarely emulates. There is a grey area between celebrity endorsements and influence marketing—a fine line where certain aspects of both strategies are mixed and matched. Proactiv’s campaign with Jessica Simpson is a fine example. She suffered from acne, and Proactiv cured it and turned her into a huge advocate. She didn’t edit or distribute the commercials, but the message was her own story, and the product was in a space she was regarded in: beauty. While these two strategies are exclusive of one another, the savvy marketer must know whether they are doing influence marketing or a celebrity endorsement, or if they want to blur the lines and borrow aspects from both. Treating influencer marketing like a small-scale celebrity endorsement, or expecting a celebrity’s endorsement to have an impact like an influencer’s, is like using a wrench to hammer a nail or a hammer to undo a bolt. Grey Geppert is the US Content Manager at Swizzle Global , a tech company providing deeper insights and data on new media using artificial intelligence and topic modeling. Contact us to find out how Swizzle is reading the internet.